This guy is perhaps close to the last tribal lord I expected to see make a comeback in a Standard set. Why? He has a cost reduction ability, which is often dangerous to a format’s health (although you wouldn’t guess it from the kind of things Wizards has printed in some relatively recent sets . . .), and he doesn’t give a power and toughness boost, which is inconsistent with most other lords, especially recently. But then again, he most often results in enormous numbers of goblins pouring onto the table and swarming opponents, and there’s pretty much nothing more evocative of that particular species. Haste is as relevant as it ever was, and perhaps more so now that we have planeswalkers to attack too. Goblins like to swarm and go fast. Goblin Warchief lets you do both. 3 mana is at the high end as far as Goblins go, so turn 4 is usually when you start playing multiple creatures. This means Goblin Warchief fits perfectly on the curve. Who doesn’t want to cast two Goblin Rabblemasters with haste on their fourth turn? A minor drawback to this ability is that most Goblins cost R or RR and already have haste. Raging Goblin, Goblin Bushwhacker, Legion Loyalist, and Goblin Guide care not for Goblin Warchief. Its up to personal preference but I would run Goblin Chieftain instead. 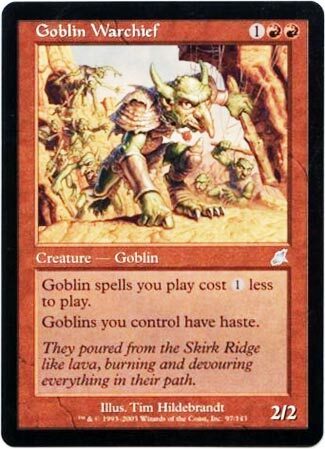 I’m not sure if this was the card Goblins needed to be relevant in Modern, but it certainly doesn’t hurt the deck! It’s a serviceable body the turn it comes down, it stacks with other copies of Warchief (even if most Goblins err on the cheaper side), and it enables big splashes that the deck sometimes struggled to put together. I’m definitely a fan.